Boden and animal print in the snow plus the tale of Mr SG's disappearing wardrobe....he's only got himself to blame. I know, it's a poor photo but I like the sun and there's a slightly better photo below where, for once, I think that I look vaguely healthy as opposed to the tonsillitis infected cold ridden creature that I have been of late. My Mum will be relieved! Here I was dressing for the snow - but not in anything that you haven't seen already! On another note, I have to say that I spent a couple of days slightly concerned as to how I was going to break it to Mr SG that I had donated a very substantial amount of his clothes (about 80% I would say) to charity, without him knowing. It all started because he complained that he couldn't hang his suits up as too many of my clothes were in his wardrobe and could I possibly take a look. Which I did. And my conclusion was that it wasn't actually my clothes that were the problem but rather it was his. So I bagged up the rejects and dropped them off for charity before you could say "moth eaten cashmere jumper". Efficient, I think you will agree. So finally I told him - but actually the fact that he hadn't noticed probably says all that you need to know. "You had some really minging clothes." I think is what I said to him. "Which ones were minging?" He asked. "We both know that I wouldn't have noticed, not as long as you replaced them with something else for me to take from the top of the pile." Which is his modus operandi when it comes to getting dressed. So now I have bought him a whole new wardrobe. It's taken hours, I've hunted high and low and over the weekend he will have to engage in his favourite (!) activity - trying clothes on. And then if he likes them, he's going to have to wear them. No more flying under the radar in one pair of jeans, a manky old Fat Face t-shirt and a shabby fleece. Oh no, those days are SO over. Oh how he's going to rue the day that he ever commented that there were too many of my clothes in his wardrobe. I've had this M&S Limited Collection dress - which you can't actually really see at all, so that's helpful - for a good few years now. I don't really remember wearing it last year so it's nice to resurrect it this year with the addition of this Whistles jacket/cardi type number, which I like because I wear it when I go out and then I leave it on when I come back in - because that's the kind of lazy dressing that I like! Somehow the addition of the scarf makes the jacket feel much warmer. I have no idea why this is but no doubt there's some weird and wonderful reason for it. Most of my wardrobe is made up with pieces that I hope to own for many years without them dating - or that's the plan anyway. Then from season to season I just update them by putting them with new bits and bobs that I've bought - well again, that's the plan. Now that Mr SG reads this on a daily basis, it's time to well and truly put my plan to the test. Yes, it's time to dig deep. I'm hoping that he's going to tire from reading this flippin' blog sometime very soon. I love the very tail end of the sales - the final markdowns, the proper discounts, you know those 70% off ones. This cashmere button back jumper from Boden (reduced to £44.70 from £189) in pale blue just happened to come my way the other day. 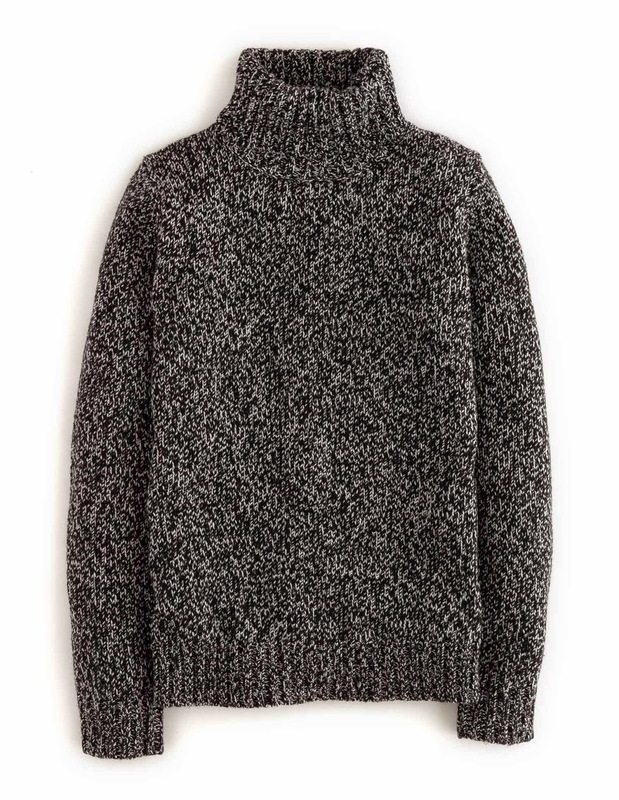 Knitwear is lovely but whatever its price, and however carefully it's looked after, compared to something like a sweatshirt or a fleece top which can be washed a million times and still look OK, it has a limited life span. For that reason I try to pick it up in the sale - as with pretty much everything I own to be honest - and then as the years pass I relegate it down the knitwear chain and finally hand it over to our 16 year old. Handy! I thought that this jumper would go well with lots of different trousers and its slightly looser, relaxed fit works well to balance skinny trousers whilst covering parts that other jumpers just don't seem to cover! For anyone interested, the jumper is only available in this colour in a 6 and a 16 (although I'm about to return a size 8 as I ordered a 6 and an 8 and the 6 fits me fine.) It also comes in a pale pink colour but that one costs £74.50. Thankfully I survived the skiing. To be honest I don't have much choice - I have to keep on going so that I'm not left behind by the rest of the family but I think that one or two more accessories may make the experience a whole lot more palatable (tee-hee). I think that it's probably pretty fair to say that we all have a lot of black/navy/grey in our wardrobes during the winter months and it can get a little tiring. Equally it can be tricky to find brighter coloured things and if we do, they stand out like a sore thumb after having been worn a dozen times so we end up getting bored of them too. Which is why I thought that this scarf could come in handy in injecting some colour into all manner of darker things. It was £20, reduced from £80 in the Whistles sale (bought at the same time as the bargain basement boots) and I stuck it with this Jigsaw jersey dress which is about four years old now, giving it a new lease of life. It will also work well with an older, navy, traditionally styled Jigsaw coat that I have, together with plain jumpers - so hopefully it will be worn enough to justify its £20 price tag. This ruched jersey dress from Baukjen (£99 down to £59) is very similar in its style to the one above and I've also linked to other Baukjen black dresses which may suit different shapes slightly better - there's a wrap one, a v-neck one, a midi length one an A-line one and a very nice leather one too! Now, despite my efforts to wear everything that I own already without any new major additions, tomorrow I will be kitted out, head to toe, in new gear. Because tomorrow I am going to "learn to ski in a day" and for that, new gear was required. Can you imagine it? Me learning to ski in a day that is? Although I'm pretty bendy and pretty active, I am rubbish on anything slippery. When I was a kid I only had to see a hill with some snow on it and I would sit down, which the children have told me that I must not do under any circumstances, because I will only go faster. And I don't do speed either which doesn't bode well. True, I've challenged myself quite a bit over the last couple of years - running the half marathon, doing various other forms of exercise and last summer doing the high ropes too. However, the problem is that when I'm scared, really scared, I have to distract myself and I do this by singing One Direction very loudly. I'm pretty confident that my singing is probably as bad as my skiing (will be) so I'm not holding out much hope for anyone, or anything, within close proximity to me tomorrow. Thankfully Mr SG is no longer planning on popping in to "see how I am getting on" (ie videoing me so that he can take the p*** out of me mercilessly) on his way back from a meeting tomorrow. So what is it that makes jeans so wearable? Well to start off with, the right pair can make a real difference to the length of one's legs and the size of one's bottom. Not only that but with a bit of stretch they can be very comfortable, they go with everything and they can be worn pretty much anywhere. So why would we need anything else when it comes to trousers? Well the answer is that we don't really, not unless there's a smarter work or formal event that requires them. Sometimes though even I fancy a change from jeans and I think that I've found them in these crepe tapered trousers that I bought from Jigsaw at the end of the summer. I had worn them once or so and for some reason I had it in mind that they were a bit scratchy but actually they're not at all. Crepe is a lovely fabric - easy to move around in and not at all constricting - a very important consideration when I need to spend a lot of time in front of the washing machine, as I do today, nor is it bulky so it's a flattering fabric to wear. I can't believe that I'm advocating an elasticated waist band I must admit that I am - it's super comfortable and I like the fact that it means that they can sit either higher, or a bit lower (not quite of the MC Hammer proportions but getting there) on the waist depending on how you feel/the height of your heels/the occasion you're wearing them for. 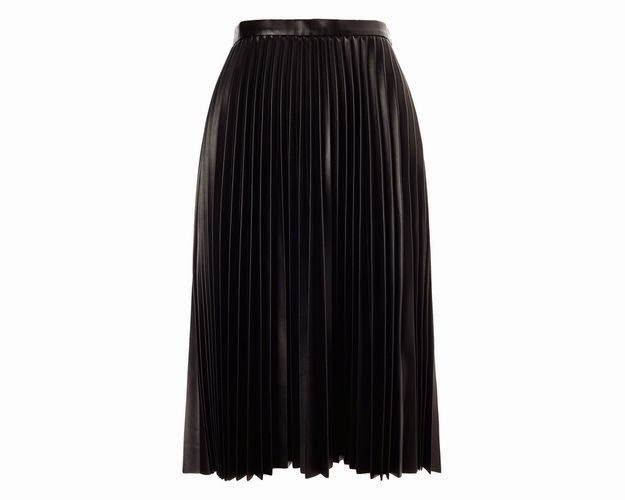 These trousers can either be dressed down with trainers, or up with heels, so they're pretty versatile too. As for a couple of options for crepe trousers, there's these sporty crepe trousers Whistles (£120) - wish they were in the sale so sorry about the price! There should be a Grazia offer in February so it may be worth holding out for that if they appeal. Or these crepe trousers are on sale at Me & Em reduced to £30 from £148 but they are only available in a size 12 - sorry can't do much about that either! 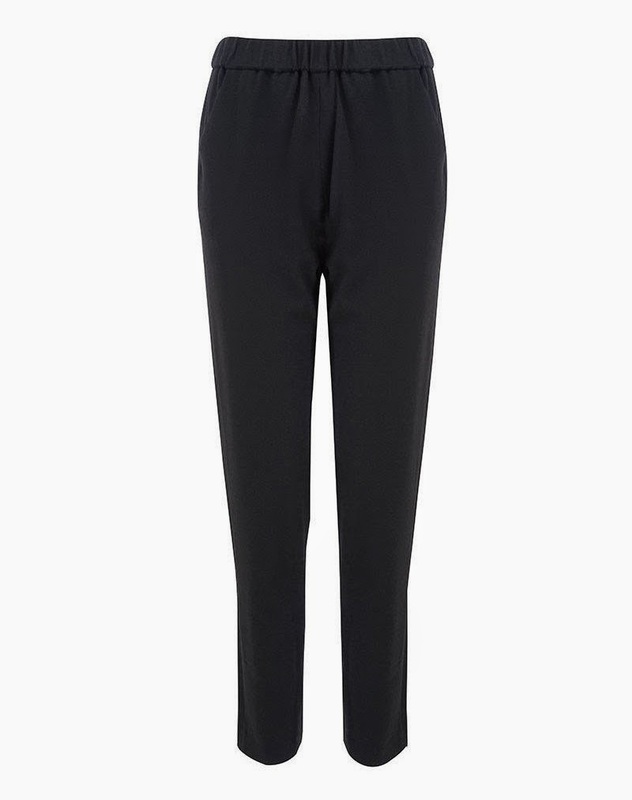 Jigsaw have these tapered leg crepe trousers for £110. I'm not sure if it's the height of the model but they look slightly shorter in the leg which is fine but it can make them a little less versatile. 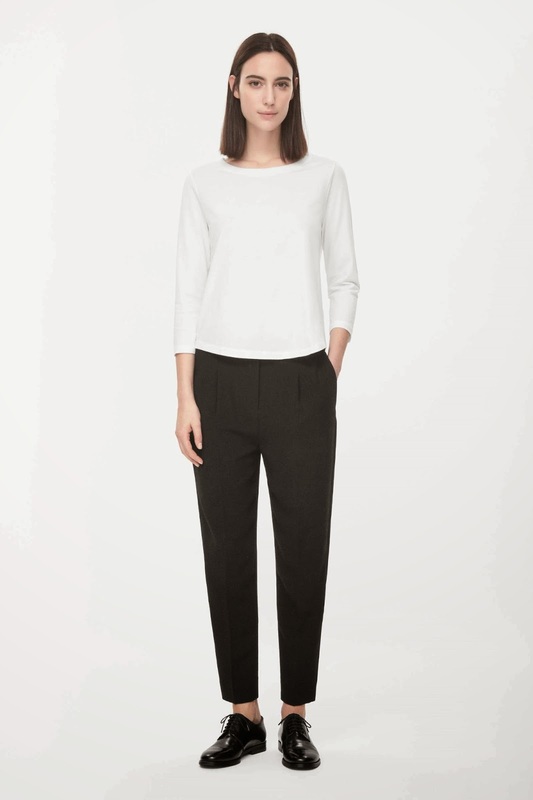 And finally Cos have these tapered crepe trousers for £59. They don't have an elasticated waist band but the close up shots on the site do make them look an attractive option. Now I must admit that despite the trousers being an existing wardrobe item, the toasty roll neck jumper from Boden (£48.30) is a new addition. My only other roll neck - which is what I like at this time of year - is a navy Cos one which is slightly short in the body and also on my gorilla like arms. And anyway if Mr SG will insist on making me go skiing, he's got to expect that one or two new jumpers will be purchased. When I first opened it I wasn't sure that it was as chunky as I was hoping for but having worn it for several hours, I'm finding it pretty warm. And finally, I bought these Grace high ankle boots from Whistles (reduced from £185 to £55) in Selfridges last week. 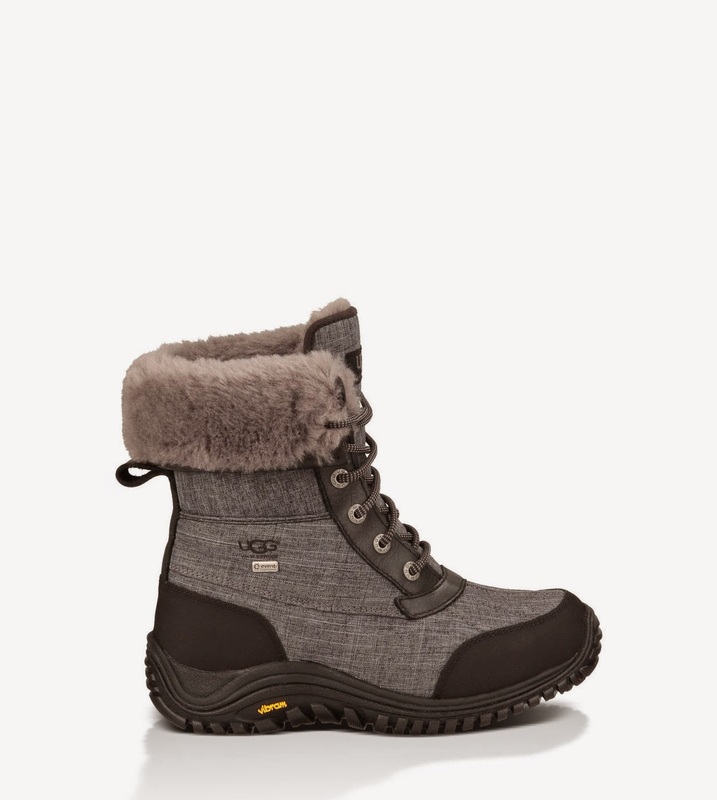 Some Christmas money that I had squirrelled away came in very handy for these brilliantly priced boots. I can't see them online any more but there may well be some lurking in the stores. Now I've discovered that my scratchy trousers aren't in fact scratchy at all, I'm going to wear them lots and lots. Now there's an idea. Anything that you own that you think is a bit stiff, scratchy, tight or not quite right, how about digging it out and giving it another go? You never know you might just discover a wardrobe hero. If not, it's time to get rid! A style staple plus Sienna Miller's hair and is it me or does Catherine ZJ look more and more like VB? Carrying on with my plan to wear everything in my wardrobe, a pea coat is a style of coat that never goes out of fashion. It's a timeless classic and if you're thinking of investing in any type of coat, this is one that will last for years - along with a biker style jacket, a leather jacket, a trench coat or a camel coat. Other styles come and go and they are nice to own in an exciting, heart missing a beat kind of way, but as they may only last a few seasons they are probably more of a Zara/Topshop buy. I had my first pea coat when I was about 23 and wanted to replace it after it had served me very well. This one from Reiss I bought in their post Christmas sale about 4 years ago now and provided that I don't grow out of it, it should last me for many years to come. Now I may be a bear of very little brain but it just can't deal with this picture. It keeps trying to make it into Victoria Beckham. The similarities between her and Catherine ZJ are starting to become a bit spooky and my little brain finds is very confuddling. Although in fairness I can't really comment about people coveting other people's looks because if I had hair that I could cut into this choppy bob, I so would. As it is it would take me forever to grow my short style out and knowing me after a few months I would cut short again so there's no point in even going there - but somehow I can't stop thinking about it which is always a bad sign. An outfit for a night on the tiles (OK, pizza with friends) and who fancies a Primark cropped top? Crikey me it's cold. Cold in a good way, a proper crisp cold way, rather than a bone chilling damp way, so that's good but it has meant that I've had to resurrect my most duvet like coat from storage. It's not featuring today but it came out last night when I walked to our High Street to have pizza with some friends. It's good and roomy so I can layer a whole outfit underneath, such as this one above, including the jacket which I bought from Whistles last year and which serves me well on days like this. So I thought that I'd follow the talk of cold with the skimpiest outfits I'm likely to wear - although just to clarify in case anyone was horrified at the thought, I don't wear cropped tops without something on top of them. This lot is from Primark, which has the most amazing selection of sportswear in at the moment in all different colours. Strategically placed just inside the door and also in our Selfridges, the shopping experience is pretty good. I've tested out the vests and one of the cropped tops and so far so good. My temperature seems to have gone haywire when running of late - I think that my jacket has been too warm and the heat hasn't been escaping so I have felt as though I was being basted like a turkey in the oven. However with a cropped top, a vest and one of the Primark hoodies (so good that I returned the Sweaty Betty one that I had ordered and which was 7 times the price) it all seemed a bit better. Anyway, we'll see. I should add that I've only tried one pair of the bottoms but they were just too low rise. Personally I prefer the thick cotton GAP ones as they offer more support for a bum that's heading south and thighs that are heading both east and west simultaneously - although I will try some other Primark ones but only when I can face taking my trousers off in a Primark changing room. Not that I can quite imagine when that will be. When it's cold, and when it's a weekend - with all that entails between myself and Mr SG in the battle of the thermostat - there's only one jumper for me to wear, a thick navy one from Cos, who are definitely one of the best brands for warm knitwear. With a vest and two long sleeved tops underneath plus a scarf, all was good on the chilly front. The scarf, bag and Ash wedge trainers delivered the little bit of burgundy that I was after to go with the navy, for my trip to.....the shoe shop for school shoes. So glam! When I've got so many layers on and my torso is warm, I can get away with my sleeveless Zara coat which is sort of liberating on the arm front. I know, fancy that, a sleeveless coat in the middle of winter. Living life on the edge again. 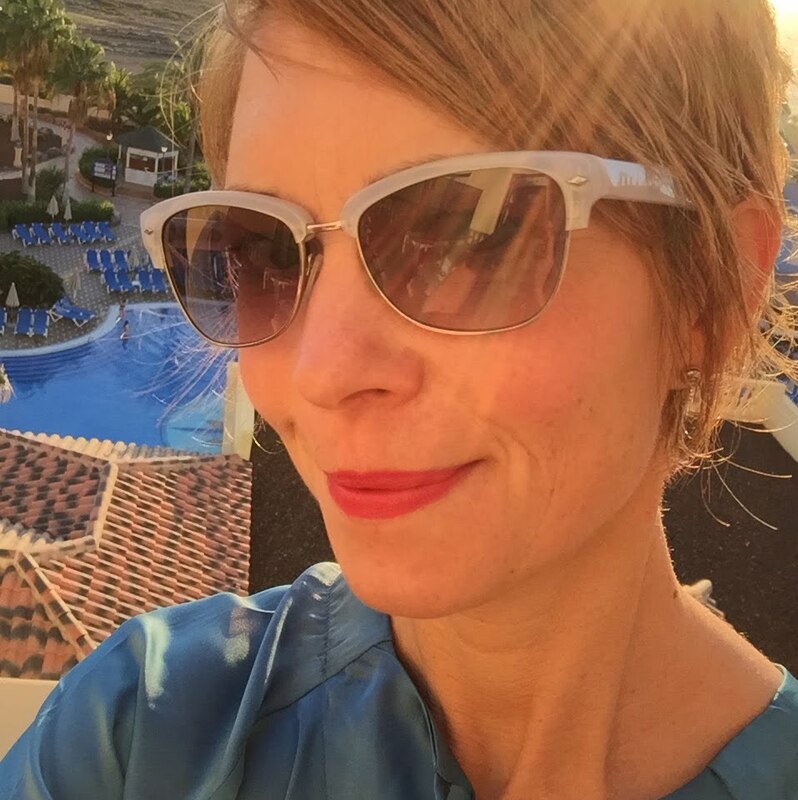 I love a bit of cobalt blue and black together but cobalt can be hard to find in the winter. In fact any brighter colour can be hard to find in the winter, although Boden, J. Crew and GAP (particularly in the sale) are always a good bet for a splash of something other than grey or navy in the jumper department. I suppose that it might be helpful to explain what it is that I find quite handy about them. First, the volume in the skirt means that it's not restrictive, which is good if, like me, you don't like to be slowed down by your clothing. Secondly you can pile thermal tights and long johns underneath and no-one will be any the wiser. Thirdly the style and fabric are a bit dressy without being too over the top so it's one step up from jeans without being either work like or too evening like. Anyway, that's where I'm coming from, so maybe it's something to ponder. There, I did it. Hardly a great achievement is it, waking up in the morning and deciding to wear a dress, especially of the jersey variety, but habits can be hard to break and I have definitely been in trouser mode of late. 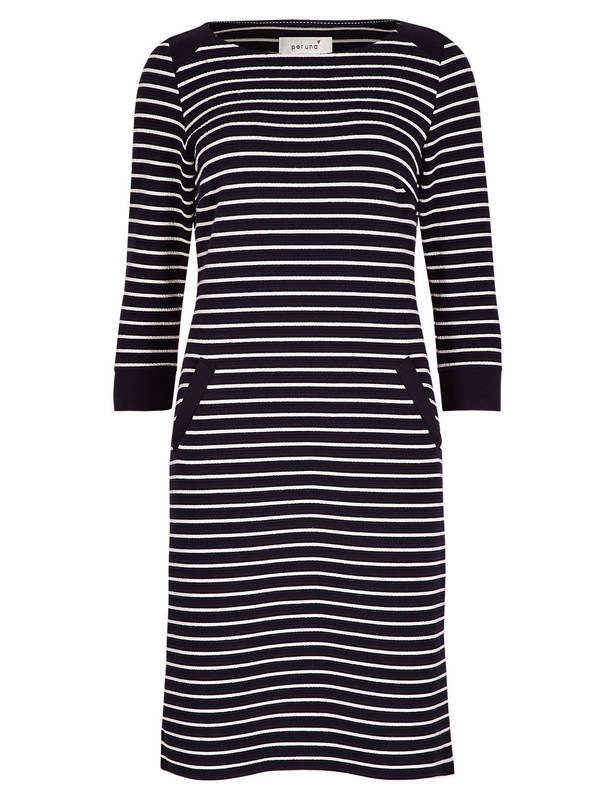 Easing myself back into this dress malarky I wore this Jersey striped dress from Jigsaw (£63 but only available in M and L although there's this alternative striped tunic dress from Per Una which is £39.50) with a white shirt layered underneath and a black Reiss jacket. The white shirt just softens the dark colour of the dress against my "winter skin" plus of course it also adds a layer of warmth. Thick black tights and Whistles pony hair loafers meant that I was totter free zone. So has anyone else ventured into dress territory of late? The smattering of snow that greeted us this morning meant that it was back to trousers today but I live in hope of a little spring sun sometime soon. I had a little bit of a navy thing going on today - not too hard give the amount of navy that I wear. It was throwing it down when it came to pick up but I couldn't be faffed with a brolly so I wore this navy metallic beanie from Topshop that that my Mum gave me for Christmas and which I keep in the car for such emergencies. OK so my jacket was less than a wise choice given the rain but the rain sort of appeared out of nowhere. The rest of the navy ensemble was made up of Cos cotton trousers, a white GAP shirt, a sparkly navy GAP jumper, a Boden jacket and Adidas trainers. I could quite happily wear this kind of thing every day - not jeans but not far from it with lots of navy and a bit of sparkle. Tomorrow I fear it may be a dress kind of day. I can't quite remember when I last wore a dress - New Year's Eve I think, so it's time to be brave and get those legs out. Anyone fancy joining me??? Please say yes! A few days ago now we were celebrating the birthday of our youngest, who is now a very grown up 7. In keeping with a family tradition, we all piled in to Pizza Express. Obviously my finest glad rags were not required but I thought that the age old cheat of wearing some bling, putting on a bit of a fancy top and chucking in some colour would do - hence the double rose gold necklace from Livto (£27.99) - currently sold out but I'm pretty sure that there will be some back in stock soon - a leather top which was a birthday present and a yellow Kate Spade bag. Luckily a little effort on the top half meant that I could get away with my super stretchy Whistles jeans so there was plenty of room for pizza (and for breathing). Always handy. Losing my shopping mojo - it can't be far away can it? I've got to be honest, I'm not feeling the love for the shops, or clothes, at the moment which is so unheard of for me that it must mean that I've been taken over by an alien. I've trawled my usual favourite sites and I'm feeling distinctly uninspired. In fact I even resorted to reading the "Runner's World" website and an article on tapering before a big race. That's how bad things are. The majority of the new season's stock looks exactly the same as that from the last two seasons - a bit drab, a bit loose, very comfortable (not that I'm knocking that) but nothing that makes me sit up and go "Yes, I will happily do whatever it takes to get my cheeky little mitts on one of those." The joy can come just from thinking about such things as much as owning them. And I miss it! Now in some ways this is good because it makes it easier to stick to my policy of wearing what I own already. On the other hand I feel bereft. Like a part of my soul is missing. I've always said that I would hate to win the lottery. Where's the fun in life in being able to buy every thing that you want? Nope, a little retail lust goes a long way - even a little £5 retail lust can go a long way. And I'm hoping that one day very soon - Tuesday would do - it will return. Wearing what I own already - a novel concept that I'm sure a few of us could adopt. When I was in a particularly hallucinatory tonsillitis induced state the other day, I dreamt that Martin Lewis, the money man, was talking to me. He was trying to hypnotise me into thinking that the Adirondack II Ugg boots that I have my eye on would be better off left on the shelf. He told me that I should imagine looking down at them on my feet and that I should think how much happier I would be if they weren't there, that the money would be better off in the bank and that I could manage with some old boots that I have. He then asked me what I thought of what he had said to which I replied "Don't be such a flippin (actually it was a ruder version of that word) idiot" and I walked off. I used to quite like listening to what he had to say. Not any more. I think that all of this came on the back of plan - not a resolution because they're a bit looserish - to wear everything that I own in my wardrobe before adding to it any further. There will be exceptions - new boots possibly being one of them - and no-one likes to live by a strict set of rules but I figure that there are probably one or two new outfits that I could make out of what I own already. So taking things to the extreme, the coat that I am wearing above is 10 years old. I bought it when our eldest was in year 1 and in two weeks she will be 16. Argghhh. The Jaeger scarf is a couple of years old and I'm wearing a Whistles tube skirt, Zara boots and a Marc Jacobs bag because I realised that if I didn't get out of sloppy stuff sometime soon, not only would I have my own TV series about never leaving the house, I would also have a parallel one about always wearing the same outfit. And I thought that on such a dull day, it would be nice to share with you all a bunch of flowers. Hope that you like them! I like to think of myself as a sunny(ish) kind of soul but today oh flip me, the sun was not shining. All three children were back at school and I missed them. The house was quiet, I still felt pretty rubbish and with a tax return to face, all was distinctly not well with the world. However, when the new Boden catalogue arrived things started to look up. Not only because it meant that I could procrastinate even longer before starting the tax return but because it gave me a major injection of spring and summer - something that was sorely needed. I'm more than prepared to accept that in months to come I may well look back and wonder quite what I was suffering from when I decided that I liked these things. However for now, I'm happy to live in a bright, striped, spotty and printed state of oblivion. Marti dress (£79) - Now obviously I wouldn't wear all of these things together at the same time. 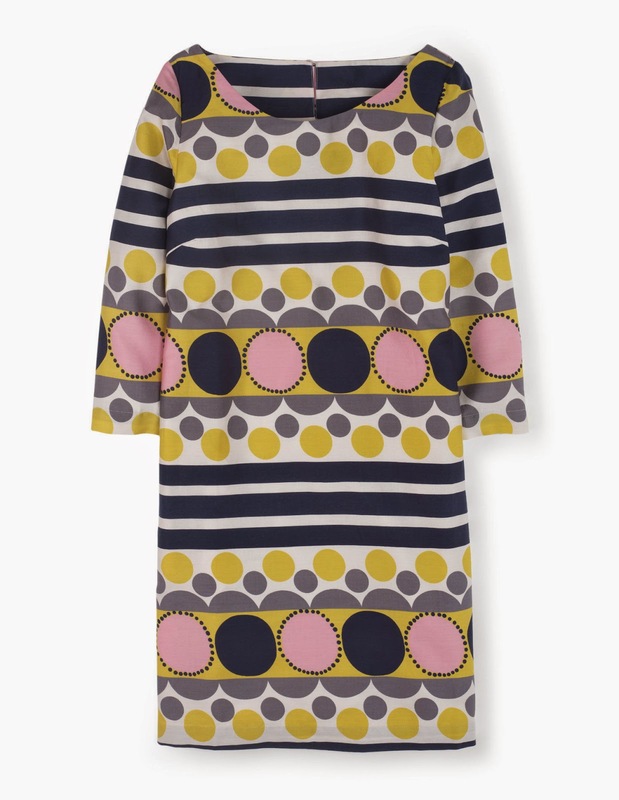 One of them would be more than an enough in an outfit but I love the colours in this dress and its Marni type feel. Its sleeves and looser shape make it more wearable than a more fitted shape. 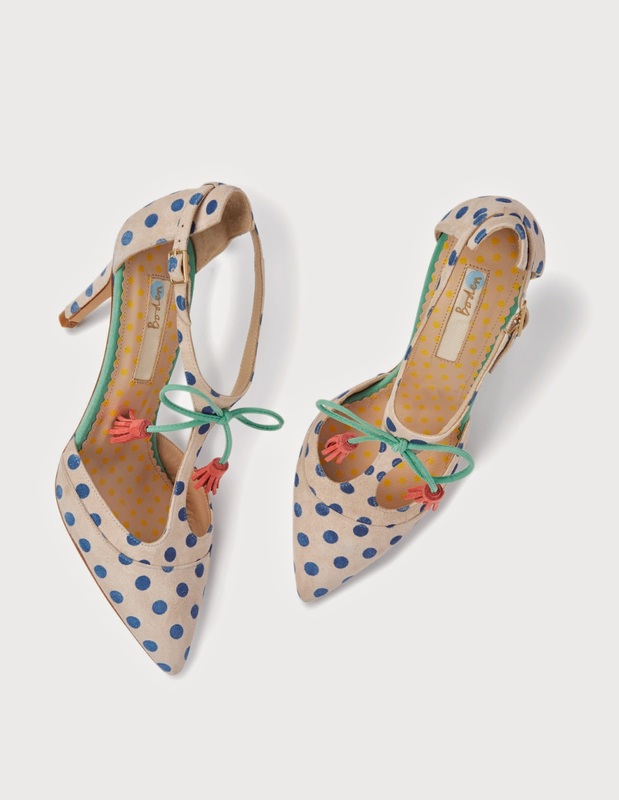 Alice high heel - These shoes definitely have a touch of Sophia Webster about them. At 8.5 cm the heel isn't too high and the colours would do a fab job of livening up a fairly plain wardrobe. There are spotty versions too - pink or blue. The obvious way to wear them is as part of an "outfit" - perhaps a wedding type affair - but I prefer the idea of them with boyfriend jeans and a fairly plain T-shirt. 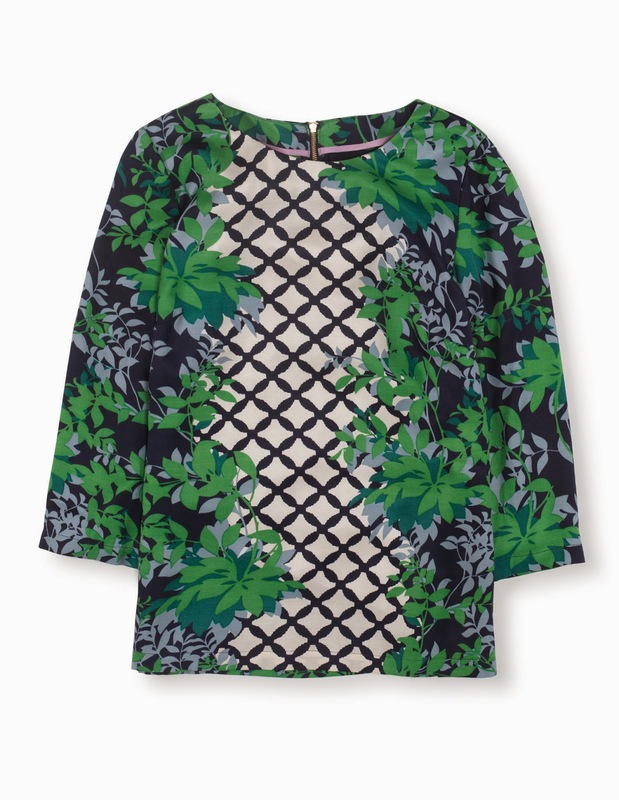 Eliza top (£69) - This top also comes in a few different colour ways and it's a great top to wear layered now, with a cardi or jacket over the top or, wait until the weather warms up and show it off in all its glory. I wrote the following post on New Year's Eve, the Eve before I was cruelly struck down with tonsillitis. I haven't even managed to leave the house so far this year. Soon I'll be appearing on my own TV show "the woman who woke up one day and never left the house again." Actually I lie, I've been out once to go to see the Doctor and can you believe that the first money I spent in 2015 was on anti-biotics? Lucky I didn't have a no spending ban in operation. I could have passed this post over but I haven't written anything else, or worn anything that anyone would want to see, ever, so here goes. Hope that you are all keeping well and Happy New Year. Thank you for being such a lovely bunch of readers! I should know myself by now. I should know that when ever there's a big event coming up - a birthday, the day before Christmas, the day before we go on holiday, the day before the NEW YEAR that I get this sudden urge to clean. "Oh" I think to myself, "wouldn't it be lovely to go to bed in clean bedding, to wake up to a newly cleaned kitchen and fresh bathrooms, to have cupboards that are neat and tidy and full of folded clothes." I should know that the tidal wave of needing to clean is on its way but I never anticipate it until WHAM, it arrives and then it's too late. I just have to get on with it. Which is why I found myself doing all of those jobs this afternoon. I scrubbed the kitchen island to within an inch of its life. I even turned the toaster upside down and shook it over the sink (unwise unless you want a blocked sink), plus I emptied out the crumb trays, cleaned behind the bread maker, took all of the rubbish out, polished the kettle, washed the tea pot and wiped out the fruit bowl, all the while thinking that I needed to be ringing friends and family to wish them a Happy New Year. We went over to some friends for the New Year and as we were walking there and as it was cold, flimsy glamour was not the order of the day - or night. I've only worn this Hush dress once but it's really warm and with a jacket over the top it gave me the warmth that I needed. OK so the boots are more practical than glam but the pavements were hideously slippery.